The 18th Edition of the IET Wiring Regulations (BS7671) came into force on January 1, affecting all construction site in relation to how cables are supported in the event of a fire. To help your construction site comply with them, Tidi-Cable have developed a new range of metal cable supports & fixings. 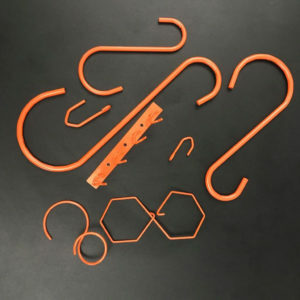 This new range of steel cable supports and fixings includes re-usable, strong and effective solutions for installing and pulling cables on construction sites. They are safe, easy-to-use and cost-effective while meeting 18th Edition wiring regulations. Fully compliant to the 18th Edition’s requirements, they can be used either to replace plastic products or to supplement them. Heavy duty cable fixings. The added benefit of the metal cable supports is the versatility to also support and fix heavier items such as armoured cables, pipework and compression hoses. Temporary and permanent installations. The new steel cable supports are ideal both for temporary and permanent fixings. Cable security. Pulling cables has its own problems and using hooks historically can be problematic, since cables might fall out of the hook. Customers asked for versions where cables can be more securely contained than just with a hook. 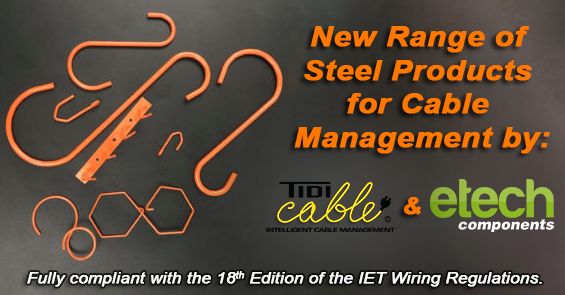 In the development of the new fire proof range Tidi-Cable have also addressed this issue with: Steel Cable Channels (TCS007, TCS008, TCS009), Steel Spiral Hooks (TCS010) and Steel 8 Hooks (TCS011). Safe cable management is Tidi-Cable‘s top priority. As construction site managers, health & safety managers or electrical contractors looking to comply with 18th Edition wiring regulations, Tidi-Cable‘s products are compliant, trusted, easy-to-use and cost-effective. Tidi-Cable Ltd are the leading manufacturer and distributor of heavy duty cable management products in the UK. Their aim is to bring cable safety to your workplace. They are fully supportive of 18th Edition Wiring Regulations. To address the issue of trailing cables while conforming with the regulations, Tidi-Cable have developed a New Range of Metal Cable Supports & Fixings.